Friends are the family you choose. My mom used to tell me that when I was young. Growing up as a military brat, I often found myself far from my relatives but blessed with a network of surrogate aunts, uncles, and cousins. This was most pronounced when we lived in Panama where we met a group of families that affectionately became known as the Panama Connection (a.k.a. the PC). For three years, it seemed like all of our holidays, trips, weekends, and even afternoons were spent together. It was an amazing place to be a kid. The jungle was our sandbox with monkeys, sloths, iguanas and agoutis around us. 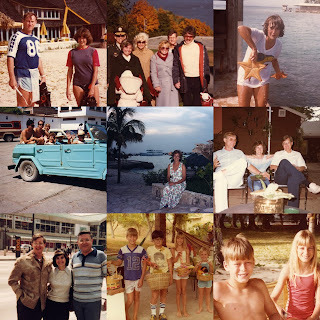 We would buzz by the Panama Canal in our little ski boat on the way to our island bohio (thatched hut) to catch rainbow bass on the weekends, watching the QE2 scraping through the locks. We would get in these huge mango throwing fights. The green ones hurt worse than the ripe ones, but you'd be sure to get a poison ivy-like reaction from the sap so it was a trade-off. But more than anything, it really was the people I shared this with, my "chosen family," that made these experiences so special. It's been about 30 years since we left Panama. The PC is now spread all over the U.S. but still gets together regularly. It's rare, though, for the entire group to make it to a gathering. But when a PC wedding rolls around, well, that's something not to miss. A few weeks ago, we all convened in El Paso, TX to celebrate the marriage of Mike and Shelly, but it also felt like a family reunion. It was my first visit to El Paso, which is a wonderful city. 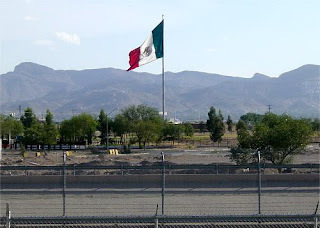 However, I didn't realize how close it is to the border of Mexico. It's literally a stone's throw. The Mexican influence is pervasive, resulting (happily!) in lots of really good Mexican food. Real tortillas, salsa that makes your tongue burn, tender chili rellenos. . . . And for whatever reason, the margaritas tasted better too. With any large group in tow, you need to keep them busy. So the groom's parents suggested the PC hit the Indian and Mexican market festival. I must admit I'm usually most interested in casing the food stands at events like this. I'm not a "fair food junkie" but, seriously, who can resist a funnel cake?! Unfortunately, nary a funnel cake did I see. Actually not even a hot dog or cotton candy could be found. No, it was way better! There was Apache fry bread (the Southwest's version of a funnel cake) and grilled corn on the cob with a dusting of delicious spices. But what stole the show for me was the asadero cheese and green chili quesadilla. I know what you're thinking: How can a cheese quesadilla be anything to get excited about? For one, the tortillas do not have a shelf life of six month. Secondly, the green chilies have an amazing depth of flavor even though they look totally unassuming. And lastly, I'm wondering how I've made it through three decades of my life without asadero cheese. The end product is this heavenly toasted pocket filled with gooey cheese and fiery green polka dots. The photos do this no justice sadly. The genius is in the simplicity. It's not trying to be high falutin'. It's just comfort food at its best. I'm quite certain if I'd gone to college in El Paso, I'd be eating this on my way home from every party I ever went to.